The Obama administration is denying official Iranian reports claiming that U.S. officials "extended an apology" to the Islamic Republic following a Tuesday standoff over the capture of 10 U.S. sailors whose boats reportedly drifted into Iranian territorial waters. The sailors were released by Iran early Wednesday morning after being arrested by Iran’s Revolutionary Guard Corps and being put in detention for the night. The Revolutionary Guard Corps, which released pictures of the U.S. sailors on their knees with hands over their heads, said Wednesday that it had conducted an investigation into the incident. Iran asserts the sailors were released after the United States apologized, prompting a flurry of denials from senior Obama administration officials. "Following technical and operational investigations and in interaction with relevant political and national security bodies of the country and after it became clear that the U.S. combat vessels’ illegal entry into the Islamic Republic of Iran’s waters was the result of an unintentional action and a mistake and after they extended an apology, the decision was made to release them," the IRGC said in a statement that was carried by Iran’s state-controlled media. Ali Fadavi, commander of the IRGC Navy, said that Tehran had missiles locked on the United States at the time of the incident. "They were in sight of our missiles," Fadavi said in Persian, according to a statement carried by the IRGC's official news outlet. "If this had happened, it would have led to their annihilation. "We had high preparedness with coast-to-sea missiles, rocket-firing fast boats, and various capabilities," he said. "We prevented their additional irresponsible movement with the statements we broadcasted internationally. It was proven to them that the IRGC Navy has the first and final word." The U.S. cannot stand up to Iran, according to Fadavi. "The result of that battle is the annihilation and sinking of their battleships," he said. "This is while in those 40 minutes [when the U.S. sailors were apprehended], it was clear that Americans were under psychological pressure, to the extent that they did not behave in a manner expected from a professional and responsible force." The Obama administration denied that an apology was offered to Iran. Vice President Joe Biden told CBS that "there was no looking for any apology." "When you have a problem with the boat, [do] you apologize the boat had a problem? No," Biden said. "And there was no looking for any apology. This was just standard nautical practice." Iran "realized [the sailors] were there in distress and said they would release them, and released them—like ordinary nations would do," Biden said. State Department Spokesman John Kirby also issued a denial on Twitter. "Absolutely ZERO truth to rumors that @JohnKerry apologized to Iran over Sailors," Kirby said. "Nothing to apologize for." Absolutely ZERO truth to rumors that @JohnKerry apologized to Iran over Sailors. Nothing to apologize for. Secretary of State John Kerry thanked the Iranian for the way they handled the situation. Kerry offered his "gratitude to Iranian authorities for their cooperation in swiftly resolving this matter." "I want to personally thank Secretary of State John Kerry for his diplomatic engagement with Iran to secure our sailors' swift return," Defense Secretary Ash Carter said in a statement Wednesday. "Around the world, the U.S. Navy routinely provides assistance to foreign sailors in distress, and we appreciate the timely way in which this situation was resolved." However, Iran adopted a confrontational tone, accusing the United States of aggressive behavior. 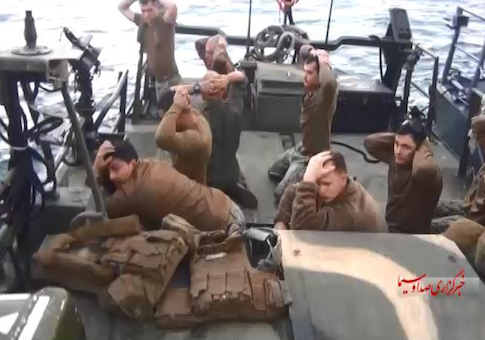 The country also released scores of pictures showing the arrest and incarceration of the U.S. sailors. The IRGC blamed the United States for its "unprofessional moves," saying that it defused the situation. Hassan Firouzabadi, the chief of Iran’s armed forces, said on Wednesday that the incident highlights just "how vulnerable" the United States is to Iran. "The incident shows how vulnerable they are. Without the good faith and tact of our commanders, the Americans would have faced a new crisis," Firouzabadi said in Persian language comments. The military leader also lashed out at the U.S. Congress. "It seems that those congressional representatives who come up with new plans against Iran every day do not have correct information and act against the interests of the American nation with their hands tied behind their back and far from reality," Firouzabadi said. "We hope that this incident in northern Persian Gulf—which probably won't be the last mistake of U.S. forces in the region—will be a lesson for disrupters in Congress," he said. This entry was posted in National Security and tagged Ash Carter, Iran, Joe Biden, John Kerry, Navy. Bookmark the permalink.